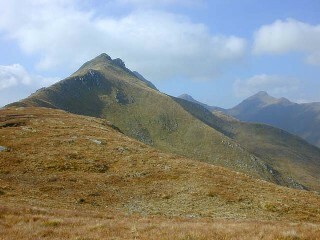 Some years ago (April 1996) I climbed with a friend to the top of Bealach an Lapain - about 750 metres above sea level - the usual start point for a traverse of the Five Sisters of Kintail on the north side of Glenshiel. We arrived on the ridge around one in the afternoon. It was a clear, cloudless day with no wind; the peaks above us were well covered with snow and ice. We had stopped to rest after the climb when something moving extremely fast (I am hopeless at estimating speed, but would guess 60-100 mph) shot past us emitting a steady whooshing or swishing sound like a large Guy Fawkes rocket. Nothing was visible, but from the sound I had the impression of something about the size of a cricket ball. I would estimate that the object passed five to ten metres from us. It was below my head height (I was standing) and about head height to my friend (sitting). A group of climbers about 100 metres away gave no indication of having seen or heard anything, although at the time it did not occur to us to ask them. The line of flight of the object appeared to be horizontal or very slightly rising, again guessing from the sound only. Bealach an Lapain runs east-west, so the object, intersecting it at about right-angles, would be travelling due south to north (grid). I was looking directly at the apparent source of the sound, but I do not have good eyesight and a small object travelling quickly would perhaps be invisible to me, even close at hand. My friend has good distance vision, but initially had her back turned to the sound. She turned around on hearing the sound but like me could see nothing which could have caused it. The prevailing (and worrying) impression was that something travelling very fast had just missed us, and the experience has puzzled us ever since. We both have much experience of climbing and hill-walking in a variety of conditions without encountering any remotely similar event. I can only think that we witnessed an unusual meteorological phenomenon, a piece of falling satellite debris, or a meteorite. I know that there were some falls of satellite debris to the north east of this area within a few weeks of the date, but I could find no information on any plausibly close to the date. Both of us had the slightly disconcerting impression of the noise being a sound of propulsion, and wondered if a military explanation was possible. Incidentally, the stalking season ends in October (although stalking of hinds may continue until the end of the year) so I have ruled out the idea of a spent bullet. The location - a popular hill-walking area owned by the National Trust for Scotland - makes that option improbable anyway. I have since heard of a remarkably similar incident several years earlier and only a few hundred metres from the same point on Bealach an Lapain. Since then I have been collecting accounts of similar events from other climbers and walkers, but to date no convincing explanation has emerged. Bealach an Lapain is at grid reference NH 009 145. In spite of the puzzlement of the walkers who have encountered it, the 'flapping' seems to be a common phenomenon caused by a small whirlwind or 'dust-devil' going over a sudden drop. The Ecuador incident sounds like firnification, but some of the others --- hmmm. Best candidate for an explanation of my own experience is a bird - but I can remember how firmly I rejected that idea at the time. If you have a story you'd like to add to the collection or can suggest an explanation, email me.